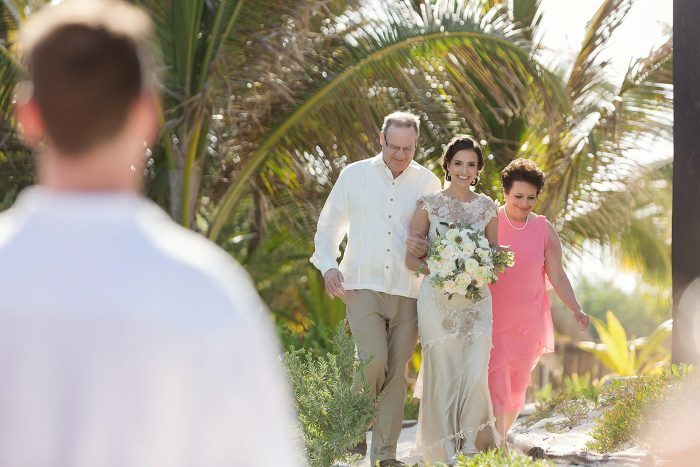 Should you have an unplugged wedding in Cancun or the Riviera Maya? To unplug or not to unplug? That is the question. 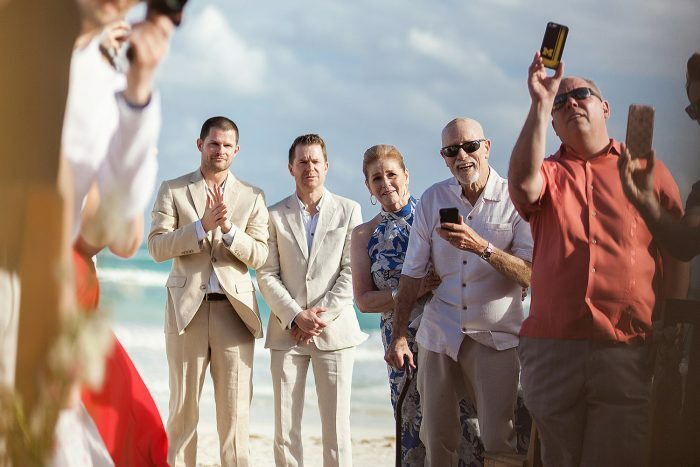 Asking your guests to unplug their phone seems to be more of a topic north of the border, than here at Destination Weddings in Mexico. Here, people have their phones off for the most part because they are traveling internationally, and they don’t want the expense that comes with international data usage. Furthermore, hardly anyone is a doctor on call, or has a baby at home with a babysitter. And even if someone had their phone on, they would rarely get decent service to check their messages.. But the one thing that guests can do is take out their phones and take a lot of photos. As a photographer, I honestly have no problem with people taking photographs at a wedding with their phones. What I do have a problem with is when they become more interested in getting photos than enjoying your ceremony. Then, of course, there are the iPads… Oh my, the iPads. For me personally, it is completely up to you with regards to how you want to deal with people and their phones. The great thing is, no one will get great service at your ceremony location, especially if your ceremony is on a beach. Most of the resorts’ WIFI is located within the buildings, and this keeps them off social media at your wedding. So the whole social media issue, that is a problem up north, is not as much of a problem down here. However, if you want to be the first to announce it on Facebook, Twitter, or Instagram then I suggest you ask your guests to refrain from posting anything about the wedding until the next day, so that you have the chance to post it yourself. That way, all the congratulations and well wishes will be on your wall forever and not on another friend’s wall. 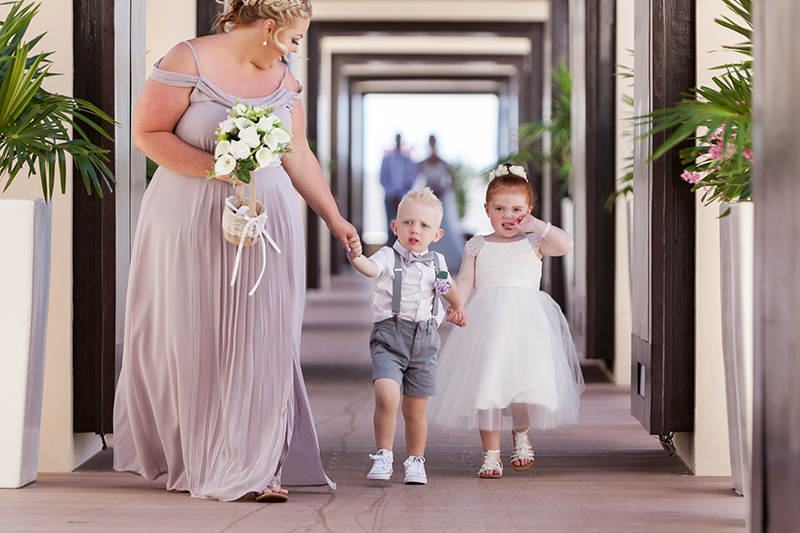 Another great thing about destination weddings is that no one has a babysitter at home or is a doctor on call. Therefore, there is no reason to have phones on. Not to mention with international roaming and long distance rates, no one will want to have their phone on. People are already disconnected, so there is little need to ask for them to turn off their devices so they do not ring during your ceremony. As I have mentioned, I have NO problem with people taking photos during your wedding, but I do find it sad when they are not present for you at your wedding because they are too busy taking pictures. I find it sad when a guest is more concerned with getting photos than they are enjoying your ceremony. The whole reason you are having a wedding ceremony in front of them is so that you can tell them you love the person standing in front of you, and that you intend to live the rest of your life with this special person. Your guests have given you the support you needed up to this point in time and you want to celebrate it with them. Furthermore, for many couples, they want to lean on those friends and family in tough times should they come. They are there to remind you of your commitments, and help you have a wonderful life with your partner. To me, this is their purpose for attending, and not to get a photo with their phones. Despite his, I still also believe that your guests should be able to take one to five photos at your wedding. I admit that it’s fun. It helps them remember the event. And it brings joy to them. So by no means, do I think your guests should not take photographs at your wedding. What I hate to see is mom or dad in the front row with a phone in front of their faces for the whole ceremony. That is not good for me, or for them. So I suggest talking to those special people and reminding them that you will be sharing the professional photos after the wedding. Now we’ve come to the Ipads…. Please, please, leave your iPads in your room! Compared to a phone, or hand-held digital camera, iPads are HUGE. They block faces, and in my humble opinion, ruin photographs. There is nothing worse than trying to photograph a bride walking down an aisle, only to be blocked by an iPad. They are big, black and grab attention to them and away from the bride, and her father. They are the worst! But the good news is that you do not have to tell everyone. People under 45-50 know this is something you do not do. It’s the middle aged baby boomer new to technology and doesn’t understand social norms that you have to look out for. My guess is that after reading that sentence you know exactly who in your crowd might bring their iPad. Please talk to them and kindly ask them to not bring their iPad. Tell them they are allowed to bring anything, but their iPad. In conclusion, I have not seen problems with technology here in Mexico in terms of ruining weddings. Apart from the odd iPad, generally people here leave their phones in their pockets. Phones are turned off and are not ringing during ceremonies. The only thing I ask is that you think of the people who have iPads, and if you see one of your guests taking lots of photos with their iPad earlier in the trip, pull them aside and have a polite conversation with them. Tell them that you have full rights to your photographs from me, and that you will share them. Be compassionate and empower them to realize that what you want from them is their love and support, not their iPad photos. The best way they can do this is to just listen and enjoy. You might want to mention this to your parents as well. I would much rather see them enjoying the ceremony, than have a phone in front of their faces. Aside from that, I want to get some great images of them as well.